By now, you know I’m a bag lady. I love a good bag, including toiletry bags. Different trips call for different bags. You don’t need the same thing for a two-week trip as you do for a weekend getaway, so why have the same toiletry bag for all your trips? My answer is to have several of those as well. Travelon has come up with the perfect size toiletry bag for weekend getaways, which I was also able to pack for my week in Vegas. Luckily, as long as you have sunscreen and a little lip balm, you’re pretty set there. This toiletry kit unfolds to reveal three separate compartments and also includes the necessary hook to keep it off the counter and out of the way when you’re limited on space in a hotel room. The top section is a mesh zipper pocket that fits smaller items. Because I was going to Vegas, I used it to hold heartburn meds and vitamin B tablets. There was also room for some other items, so I slipped some bobby pins in, my eyeliners, lip balm, tweezers and mascara. The middle section has three mesh pockets, which are perfect for your shower stuff if you aren’t taking a plane to your destination. Since I was, I used it for our deodorants and makeup – eye shadow, eye brightener, lid primer, concealer, mini kabuki brush and foundation powder. The bottom section is the largest and has one big mesh pocket (I love the mesh pockets, because nothing can get stale and gross and it’s easier to clean if you have a spill). I packed two travel toothbrushes, two razors, solid shampoo and solid conditioner, a comb, and pop-out comb, blush and my makeup sponge. As you can see, quite a bit fits in here and you can probably get more in it if you’re only packing for yourself instead of two. You’ll notice that many of the things I’ve packed are travel size or trial sizes. I hold on to those when I get them from my beauty purchases and save them for my trips. You’ll be surprised by how long some of those little sizes will last. Next time you order something or take a trip to the mall to replenish your beauty box, snag a small size of one of the products you use and you won’t have to make do with a replacement when you go on vacation. Of course, there are sometimes products I prefer on vacation to the ones I use at home, simply because they’re multipurpose or work better for the climate. As you can see, this little toiletry bag is small on the outside, but big on the inside. It fit perfectly in my carry-on next to my packing cube and took up very little space, allowing me to bring other items I needed. 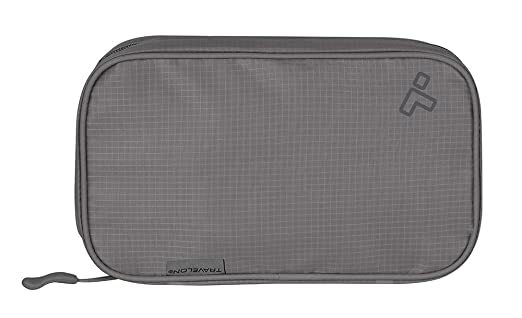 If you don’t travel with much, you like separate toiletry bags for each travel or you go on a lot of short trips, you’ll definitely want to invest in one of these. At just $20, it certainly won’t break the bank, plus the water and stain resistant nylon will ensure spills stay inside your bag and wet counters won’t seep through and soak your stuff. Do you have different bags for different kinds of trips? 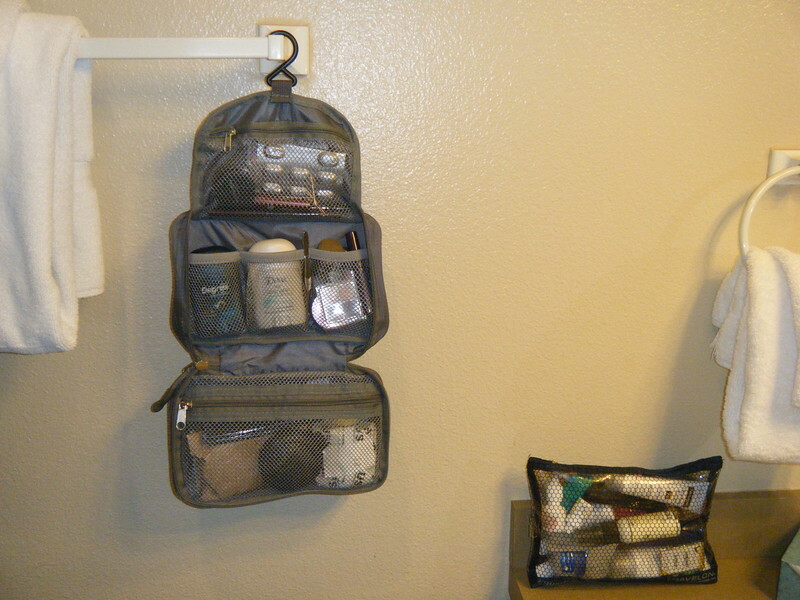 Disclaimer: I was sent the Compact Hanging Toiletry Kit by Travelon for the purposes of this review, but all opinions are 100% my own.